Do I need a 12 string accustic? I just borrowed one for a session and I must admit it’s got a thing! Right? I picked one up at a pool party the other day and played it for some folks - a one trick pony in my hands, but a danged good trick. I don't know about a 12-string acoustic (been there, done it, OK), but this only increases my want for an Eastman. They're so classy. Great simple, elegant headstock design...good enough logo...nice appointments. How much time do you have for tuning? Mine stays in tune every bit as well as my other guitars. but this only increases my want for an Eastman. Come on out to the NorCal Roundup, I’ll bring both of mine and you can try ‘em out. Heck, make me an offer on ‘em, I can get more. The old joke is that you spend half your time tuning a 12-string and the other half playing out of tune. But Eastmans sound pretty remarkable, I’d like to try more of their acoustics. My local guitar emporium has an Eastman 12er (admittedly not as pretty as Hipbone’s) that caught my eye last time I was there, perhaps I’ll take it for a test drive. Congrats. Please let us know if it’s keeper. Looks like it has reverse stringing like a Rickenbacker. I have 6 Hofner model 490s slope shouldered dreadnaughts from 1966 and 1967 patterned after a Gibson J-160 with regular stringing and 2 Klira square shouldered dreadnaughts patterned after a Martin D-28 (Klira was a defunct German guitar maker) from the early 1970's that have the reverse stringing of a Rickenbacker. All of them just bring an added dimension to playing. You might not play them every day but, boy, they can hit the spot when you need "different"
It's a lefty...I think that may have created an illusion of Ric' stringing. Very simple - you play guitar? Well you should have a minimum of (1) preferably (2) 12 strings. Eastman makes excellent guitars. I own a T486B and it has a nice wide neck. I was unaware that they made a 12er. 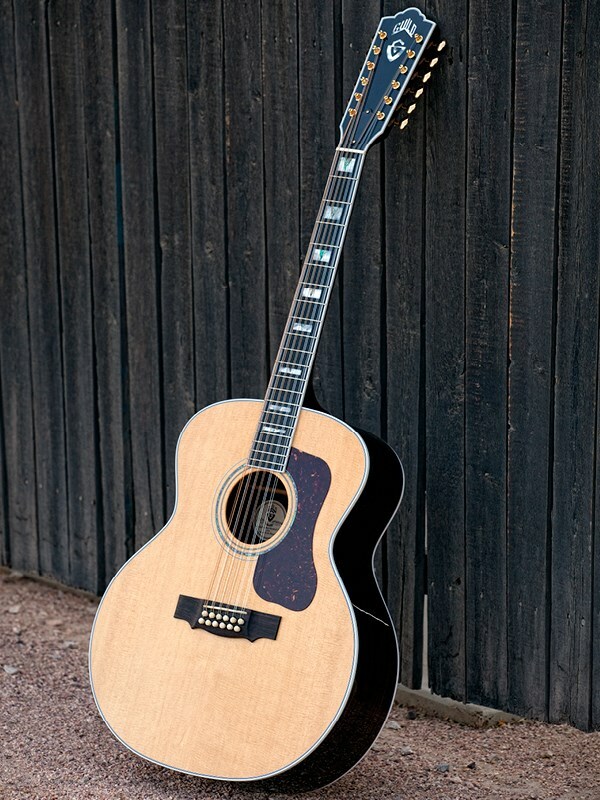 Jumbos are the perfect body type for an acoustic 12 string. Congrats. I don't know if you need one sir ,but i do know i want one of these! Guild F - 512 Rosewood Jumbo Natural. But i found out i really like 12-string electric. So much music from my youth (Smiths!) is played on 12-string electric. I didn't fancy a Rick, because the you have to play Byrds & Tom Petty, instead i bought the Gretsch G5422-12 and is it so much more fun for me. It's is of course a totally different animal than a 6-string acoustic. So at the moment i'm re-discovering my 12-string acoustic again, through the electric. Although i gathered a nice collection of guitars over the years, i'ts been a long time i had so much fun with a new toy! I love having a 12 string acoustic. I regret selling a Gretsch Historic 12 string I once owned. It was a beauty! I have a custom made Les Paul 12 string I'll bring to the Gretsch Roundup this fall if anyone would like to give it a whirl. It arrived this morning.... Wow! Is my first impression. It is a thing of beauty. Congratulations! Looks like a keeper. The Abalone is gorgeous... I was reading that it takes 80 man hours to build these guitars. The apotheosis of acoustic 12 string. One of these days I'll get one. In the meantime, I'll enjoy my Alvarez. Congrats to the OP on a great acquisition. 2100 Celtic folk shows and still going strong. In fact, I had two at once for a while, but the backup stayed in the case far too much, so I finally sold it off. Meantime, this baby stays in tune, the electronix have never failed me and I could take her out tonight if need be. Great, almost unbreakable 12 string. Eastman serial numbers are a mystery to figure out, so I wrote them asking for any info on the guitar and this is the response.